With a maximum work envelope of 19' x 4' x 4' x 8’ (L x W x H x D, or round parts up to 96” diameter), the EBAM® 300 Series by Sciaky offers the largest build platform of any metal 3d printer commercially available. Designed to additively manufacture large-scale parts and prototypes from high-value metals like titanium, tantalum, Inconel, niobium, and other alloys, the EBAM300 is the only 3D printer on the market that has produced a metal structure exceeding 10 feet in length. Beyond size, the EBAM 300 is also one of the fastest industrial 3D printers commercially available with a deposition rate ranging from 7 to 20 lbs. per hour. It produced a 10-foot-long titanium aircraft structure in 48 hours at a rate of approximately 15 lbs. of metal per hour. In general, forgings that used to take 6-12 months to complete can be completed in 2 days with the EBAM 300. 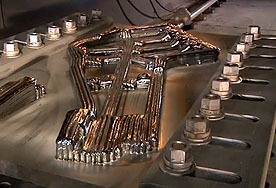 This Electron Beam Additive Manufacturing (EBAM) system also provides an extremely high degree of control over part geometry and material composition because of its patented IRISS Closed-Loop Control Technology. Savings on raw materials—often precious metals—can be huge with EBAM (up to 80% for large-scale parts) because of the substantial reduction of material waste. The EBAM 300 is used to create, improve, and repair next-generation end-use technology in the aerospace and defense industry, energy industry, metals industry, and many other verticals. It is a full-scale means of production for corporations and institutions in need of a system that can do more than build flimsy prototypes and/or headline-grabbing objects without real function. This marks a sharp contrast between Sciaky and other 3D printing companies that say they sell “the largest 3D printer in the world” because it’s a marketable proposition. The truth is: while there are indeed 3D printing systems that can print entire buildings, houses, car replicas, bikes, statues, etc., generally, the bigger the printer, the weaker the business case. For example, if you run a Google search for “who makes the largest 3d printer?” you will find that most mega-scale 3D printers are a) not commercially available and b) are only useful to a small consortium of individuals and even fewer real-life applications. Why? In a nutshell, huge parts made out of sand, plastics, and other particle materials aren’t practical for most companies. That’s not the case with Sciaky. We may not be able to say that we make the biggest 3d printer on the planet, but we do make the world’s largest 3d printer that is fit for the industrial/commercial production of functional metal parts. To learn more about 3D printing large metal parts with Sciaky’s EBAM process, call us at 877-450-2518.